The Bard’s book takes a 52-stop journey By Erin Blakemore Erin Blakemore is a Boulder, Colorado�based historian, journalist, and author of the award-winning The Heroine’s Bookshelf (Harper). Her work has appeared in publications like Time, mental_floss, and Smithsonian.com. Martin Droeshout’s engraving of William Shakespeare adorns the title page of the First Folio (1623). In 2016, the Folger Shakespeare Library will send its Folios on a national, yearlong tour to promote interest in the Bard and his book. Courtesy of the Folger Shakespeare Library. On April 23, it will have been four hundred years since the world’s most popular playwright died. But the Folger Shakespeare Library won’t wait until then to celebrate its namesake. Beginning in January, the Folger will launch an unprecedented, 52-stop traveling exhibition of the Bard’s First Folio that sounds more like a rock star’s tour schedule than the display of an antiquarian book. For Shakespeare’s dedicated fans, the build-up to First Folio! The Book that Gave Us Shakespeare is generating hype worthy of William himself. In this case, the real celebrity is the first collected edition of Shakespeare’s plays. 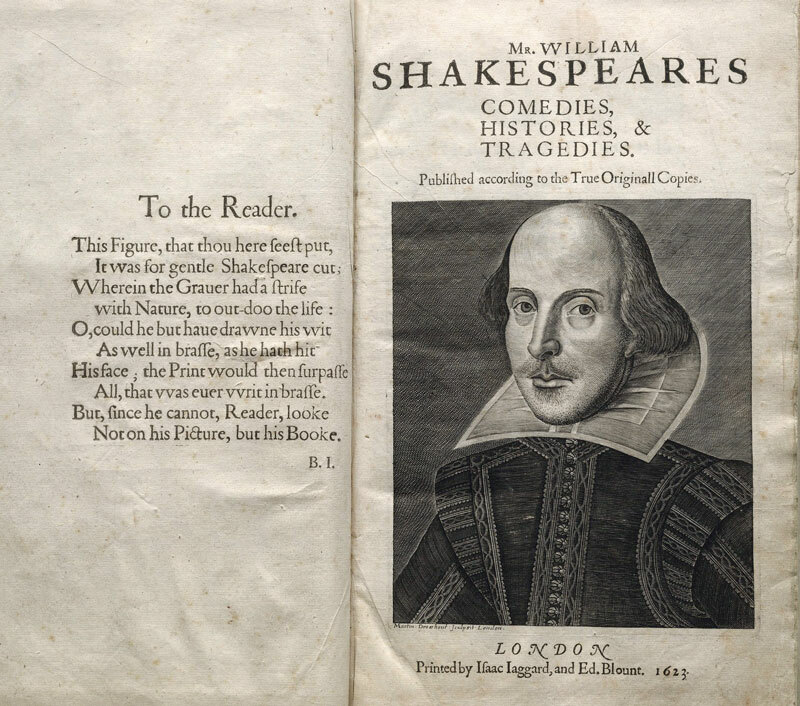 Just 750 copies of the book are thought to have been printed in 1623, and the Folger owns more than a third of the 233 copies still known to exist. When John Heminge and Henry Condell, actors and friends of Shakespeare, collated thirty-six of the Bard’s plays into a single edition just seven years after his death, they were doing fans and future scholars of the playwright’s work a real service. Despite arguments about which plays Shakespeare actually penned, the First Folio is considered the only authoritative text for at least eighteen plays, including Macbeth. First Folios are fragile, rare, and extremely valuable, making the logistics behind the book’s itinerary a worthy challenge for the world’s largest Shakespeare collection. “There’s so much to think about as we prepare the Folio,” said Sloane Whidden, registrar and exhibitions manager at the Folger. Since the tour will hit all fifty states, Washington, D.C., and Puerto Rico in just thirteen months, she added, the library’s first priority is the Folio’s safety. “That means silica gel,” she said with a laugh. Whidden explained that the library commissioned a special case for the Folio, which will be open to Hamlet’s “To be or not to be” speech while on display. The case was designed to keep the Folio at a stable relative humidity at all times, and contains a data logger that measures the internal and external environment at all times. Like any VIP, the Folio comes with an extensive entourage. The exhibit itself is being put on in partnership with the Cincinnati Museum Center and the American Library Association and coordinated by the Folger. The library’s team will work directly with hosting venues, each of which underwent a screening and selection process, and will provide oversight, security, and consulting to each venue. Inside the library, there’s been a flurry of activity as conservators, curators, and events coordinators figure out every last detail.